All right, everyone. What I'm about to say may shock you. But the La Prairie Silver Rain Bath and Shower Gelee retails for $95. And yes, I know that is a fortune when it comes to shower gel. But hear me out before you judge ... this is one of the best. The Silver Rain fragrance is inspired by the alpine glaciers at the top of the world, where the purest of rain transforms itself into silverized ice crystals. And the water is so pure that when the sun glistens, it appears silver! These crystals melt and drop to the ground 1000 feet below in the spring and are called "the silver rain of the Alpine Valleys." When I first took the bottle out of the box, I was stunned into silence by its beauty. La Prairie's iconic sweeping raindrop silhouette has been fashioned into an iridescent, incandescent work of art that contains a beautiful pale orange gel. It swirls and swishes around the bottle, adding to the luminosity of the design and bringing a true work of art into the shower. Then it came time to actually use the gel, which I have to admit left me in confusion for a moment. Try as I might, I couldn't actually figure out where the bottle opened! But then I realized there was a little latch at the bottom that, when opened, released forth such an unbelievably fragrant gel that I was again stunned into silence! 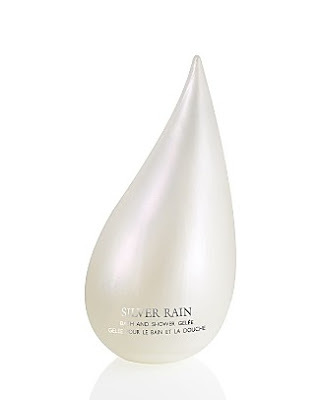 The Silver Rain fragrance contains a variety of notes that are guaranteed to delight. Top notes of crisp green apple, verbena flower, dewfruit berry, anise seed, crushed coriander and bergamot zest combine with a heart of gardenia tuberose blossom, red rose petal, juicy plum, star magnolia, crystallized sugar accord and night-blooming jasmine. The fragrance finishes with notes of patchouli leaves, red sandalwood, creamy tonka bean, heliotrope flower, vanilla infusion and rich musk. The end result? It's crisp, light, fresh and just a touch exotic. So trust me -- if you have the $95 to spare, La Prairie Silver Rain Bath and Shower Gelee is worth the splurge. still, I'm far from being a fan of so expensive products. I'd never use them or I'd be like *boo my shower cost me 10$ for 4 mins* woohoo. Miss Doorie: Thanks for your comment. I understand this might be an unnecessary splurge for some. And just FYI, I actually didn't mention the Alps. I talked about the alpine glaciers -- different thing!